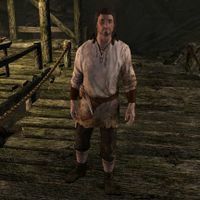 Borgny is a Nord miner, and is one of the many people who work in Quicksilver Mine in Dawnstar. He works inside the mine around the clock and never even sees the light of day. Occasionally, he sits down on one of the available chairs and rests. He never pauses to eat or sleep. He wears a set of miner's clothes and a pair of boots, and is equipped with a pickaxe. He carries a selection of lower-class items and gold. When approached he will just say: "Plenty of iron to dig." and "Mining's an honest trade. No real tricks to it." He speaks about digging iron, even though he works in Quicksilver Mine. This page was last modified on 24 December 2017, at 03:55.